Eizo Library: How Does a Hybrid OR Differ from a Standard OR? Home / Press Release / Eizo Library: How Does a Hybrid OR Differ from a Standard OR? When you think of an operating room, most people imagine the typical OR with a surgical table in the centre, a bright light overhead, some trays of tools, and the iconic heart-rate monitor. 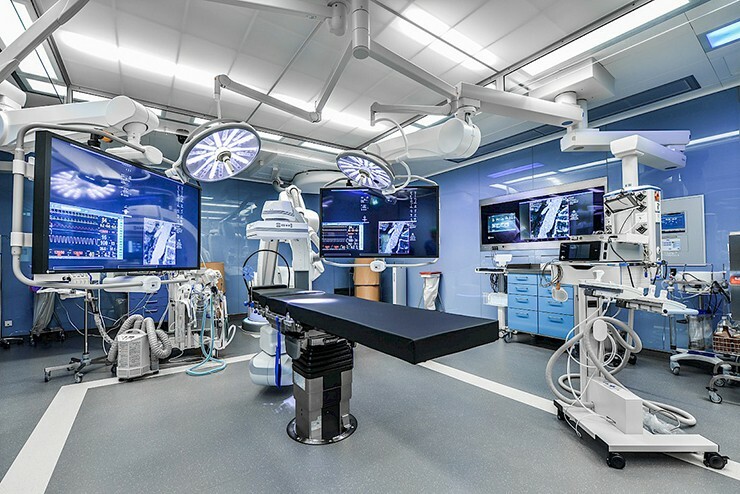 While this is certainly true for some operating rooms, there’s a new breed of operating room making its way into the hearts of hospitals around the world: the hybrid OR. Read on to find out what a hybrid OR is, and how it differs to a standard operating room. These days, minimally-invasive surgery is the most common approach to surgery. Compared to open surgery, it reduces the healing time for the patient, and also reduces the risk of infection. Additionally it improves aesthetics by reducing the amount of scarring to the patient. Typically a patient undergoing surgery has medical images taken beforehand in rooms dedicated to each imaging device. Because these devices are typically large and expensive, most hospitals have them in separate rooms outside the OR. The doctors will use these imaging devices to identify the problem, and then operate on the patient by using long-shafted instruments that are inserted into the body and guided by a surgical camera. Therefore, inside a standard OR the typical information that needs to be viewed is just the surgical camera feed, vitals, and perhaps previous scans for reference. 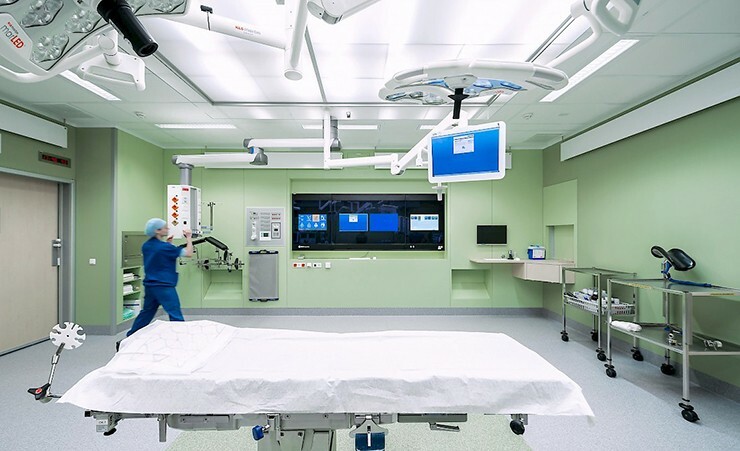 Most modern operating rooms will use a wall panel to display reference material, with either a wall or ceiling mounted monitor, and/or a trolley-mounted screen to view the surgical camera feed. The Elisabeth-TweeSteden Hospital in the Netherlands uses an EIZO wall panel in their OR. An operating room at the Elisabeth-TweeSteden Hospital, the Netherlands. The biggest difference between a standard OR and a hybrid OR is the presence of imaging devices. In a standard OR, the medical imaging devices are located outside in different rooms in the hospital, whereas in a hybrid OR a C-arm (for x-ray), CT or MRI machine is installed in the room. This has allowed for new types of minimally invasive surgery and it aids in faster diagnostic results, leading to shorter operation times. Hybrid ORs differ depending on the type of surgery the hospital wishes to specialise in. As C-arms, CT and MRI machines are so large, each hybrid OR will install only one. And, depending on this device, the types of surgeries that can be carried out differ. Hybrid ORs fitted with c-arms (a kind of live x-ray) are best suited for cardiovascular surgery. This has allowed for new types of surgery such as TEVAR, EVAR and TAVI. These surgeries use a small catheter which can then be moved into position by viewing its location using the live x-ray rather than open-heart surgery. In this way, only a single small incision is required on the patient, making it one of the most minimally invasive surgeries to date. The other type of hybrid OR uses either a CT or MRI machine. These ORs are best suited for neurosurgery where diagnostics can be received faster, and operation times reduced. It also helps surgeons plan a surgery in detail before operating. Whether a hybrid OR uses a C-arm, CT or MRI machine, they undoubtedly need a lot of screens to display all of the information. Some of the information being viewed may include live surgical camera feeds, x-ray, any CT and MRI scans – which may need to be updated throughout the surgery, and of course vital signs. The amount of information varies by surgery, so hybrid ORs need to be equipped with a wide range of monitors and screens to display any information that may be required. These can take the form of wall or ceiling-mounted arms, on portable trolleys, or as large wall panels. The Cardiac Center in the Luxembourg Cardiac Hospital has one of the world’s most modern hybrid operating rooms. They incorporate a range of EIZO monitors to visualize all the required information. They also use EIZO’s Caliop software which helps to manage the immense amount of visual information, preventing any loss of information and allowing a user-friendly display management. The Luxembourg Cardiac Hospital is a modern hybrid OR that utilizes the full range of EIZO’s operating room solutions. EIZO offers a full range of visual technology solutions for the operating room, be it a hybrid OR or a standard OR. EIZO monitors come with fail-safe technology to ensure that there is always a consistent image throughout the entire surgery. They are ergonomically-designed for the operating room, and come in a wide range of sizes and formats. EIZO also offers software for easily managing the displayed information, as well as signal transmitters, and video management devices. Furthermore, EIZO also has an extensive support system to ensure that your products are working as they should be, when they should be.